The original 1957 version of 3:10 To Yuma—one of the first film adaptations of an Elmore Leonard story, alongside 1957's The Tall T—is a typical psychological Western, a lean, rangy black-and-white film as much about what its protagonists are thinking as what they're actually doing. It opens straight into the central action, with a stagecoach robbery gone wrong, and only comes back to establish its characters' backstory with a few spare sentences. By contrast, the 50-year-anniversary remake directed by Walk The Line's James Mangold jumps into a different action scene that establishes the desperate situation of Arizona rancher Christian Bale, in debt and about to lose his land. Screenwriting team Michael Brandt and Derek Haas (2 Fast 2 Furious) spend more time digging into their characters than Leonard did, as if determined to make sure viewers know and care about all of them before they start facing hails of bullets. They're also determined to up the body count considerably. That becomes clear during the key robbery, which was an almost civil affair in the original, but becomes a bloodbath this time around. Still, while outlaw leader Russell Crowe is an unrepentant killer—when a surviving guard takes one of his men hostage, Crowe casually shoots them both dead—he has his honorable side. 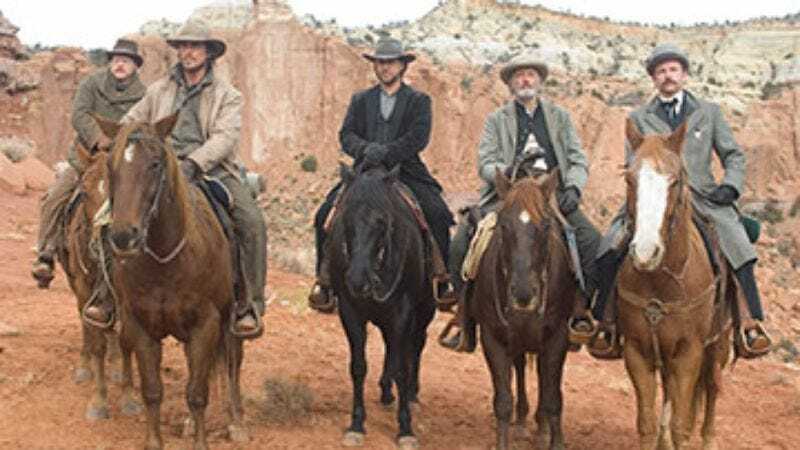 When Bale and his two sons happen across the theft in progress, Crowe leaves them unharmed, but on foot, though he thoughtfully tells them where he's planning to leave their horses for retrieval. Still, Bale is humiliated by his helplessness and by the judgmental cynicism of his teenage son Logan Lerman. When Bale decides to help capture Crowe, evade his murderous gang, and transport him to a train bound for Yuma Prison (in a sort of Old West version of 16 Blocks), he's partially motivated by a desperate need for the cash fee, but his desire to regain his son's respect likely plays a major role too. It's hard to tell, since Bale and Crowe both play their cards close to the chest, embracing the Western aesthetic with tight, controlled performances. The film itself is more expressive, with its gory murders, big chase scenes, explosions, and other major expansions of the originally short tale. Brandt and Haas go too far in trying to pack their characters with extra humanizing characteristics—Bale has a peg leg, Crowe likes to sketch his surroundings—and their version of the ending seems ridiculously improbable. But Mangold delivers a taut modern take on a lesser classic, preserving the High Noon themes about doing the right thing against all odds, and injecting a more modern pacing and urgency without going overboard. His film isn't Leonard's classic, but it's a solid, genre-respecting Western in its own right.